Soo, I'm doing a lab report about Newton's Second Law and I've encountered a small problem. And, well, if I go by the Second Newton's Law and write the equation of the system, it would be: mg=(M+m)*a, because the tension cancels itself. where m is mass of the weight, and M mass of the trolley. So iI though that the gradient of the graph would be --> a=m* g/(M+m), so the gradient is g/(M+m), or??? And what is it at all? 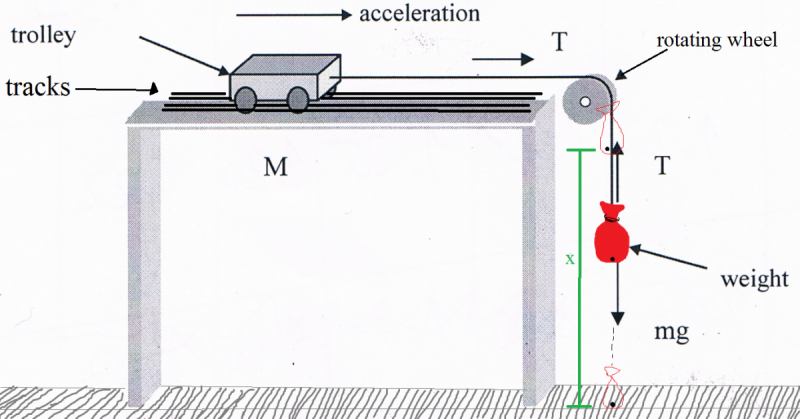 Can't you put the material you remove from the weight on to the trolley, so that the total mass (M + m) remains constant while you vary the accelerating force mg? Then (assuming zero friction and air resistance, ideal string and massless wheels etc) you could plot a against mg to obtain a straight line of gradient 1/(M+m). If not, I would suggest plotting a against m/(M+m) in order to obtain a straight line plot with gradient g.